Our Phoenix Wellbeing & Recovery Service is launching a brand new peer support group for young people who hear voices, see visions or have other unusual sensory experiences aged 16-25yrs. This group, facilitated in partnership with our Voice Collective young people’s project, will provide a safe space for young people to come and share their experiences and find ways of dealing with them. It is completely free and open to young people no matter where they live (we welcome people both inside and outside of Camden). 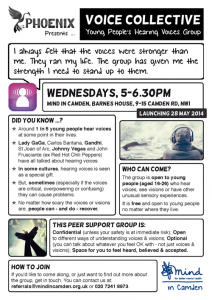 The group launches on Wednesday 28th May and will run weekly from 5.00 – 6.30pm at Barnes House, 9-15 Camden Road, London, NW1 9LQ. It will be facilitated by Mel and Rai. This is a group that we’ve had lots of requests for, so we’re really glad to be able to provide it. If you, or someone you know, is interested in coming along – please email us at referrals@mindincamden.org.uk or call 020 7241 8973.